GEORGE HENSCHEL Autograph letter Signed. Sir Isidor George (or Georg) Henschel. German born British pianist, baritone singer, conductor and composer. ALS. 3pp. 45 Bedford Gardens, Kensington. October 22nd 1892. 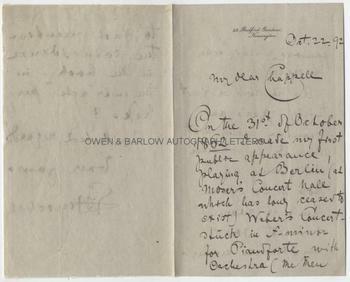 To "My Dear Chappell". "On the 31st of October 1862 I made my first public appearance, playing at Berlin (at Moser's Concert Hall which has long since ceased to exist) Weber's Concertstuck in F Minor for Pianoforte with Orchestra (the then famous Liebigsche Kapelle). As it will be just thirty years on Monday week next when I, by chance, shall sing at the Pops, do you think it would interest your audience enough to just mention the coincidence in the book - in the end [?] 'acte' [?] perhaps. With best regards, Ever yours, G. Henschel". 8vo bifolium. Approx 7.5 x 5 inches (19 x 12.5 cms). In fine condition. 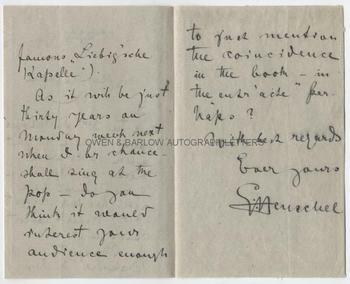 George Henschel is here writing to Samuel Chappell, the Bond Street music publisher and musical instrument seller. 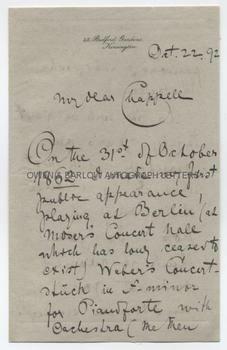 Chappell had inaugurated a series of Monday and Saturday Popular Concerts (known as "the Pops") at St. James's Hall, London. For many years these were hugely successful and the venue saw most of the great musical performers of the time and the London premiere of several great works. George Henschel was a close friend of Johannes Brahms. He had made his home in England from 1877, where he established himself as a very fine concert singer and pianist. He often appeared with his wife, the American soprano Lilian Bailey. He became the first conductor of the Boston Symphony Orchestra in 1881. George Henschel was knighted in 1914.